In 1991 the Arkansas General Assembly set a 40% waste diversion goal to be reached by 2000. As a state we met that benchmark. Unfortunately, economic factors have led to a recent decline statewide. According to Robert Hunter, ADEQ Recycling Grants Manager, it’s estimated that only 32% of the solid waste stream is currently being recycled in Arkansas. The Ozark Mountain Solid Waste District increased its recycling efforts from 9.9 million pounds in 2008, to 11.4 million pounds in 2009. Per person, that’s an increase from 76 lbs. in 2008, to 87 lbs. per person in 2009. We are gaining ground, and just getting started in improving our waste diversion rates. New recyclers are handling their waste more responsibly every day. The District’s diverse recycling and waste service programs, combined with more of our citizens making responsible choices, continue to improve recycling rates. Over $320,278 in revenue was generated in 2009 from recycling activities in our District. We received $174,748 in grant dollars that same year. While we are getting better at recycling and a better return on our grant dollars, we still have work to do. The responsibility lies within each of us. Below is a summary of the recycling programs in the district. For specific information about services offered in your area, click on your county’s link to the left. 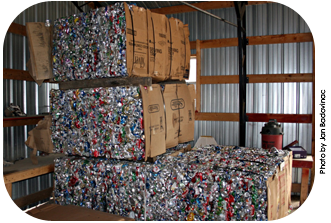 Each of the six counties within our district has a recycling center. Check with your county center to find out what products they will recycle. Carroll, Newton, and Searcy Counties, and the City of Harrison have curbside recycling programs. In 2010, the District recycled over 3400 tons of paper, 200 tons of plastic, 180 tons of metal and 530 tons of glass. The District coordinates the funding for recycling grants available from ADEQ, with the grant cycle in 2011 bringing $176,169 to the District for its recycling programs. The District’s electronic waste stream continues to grow as computers, televisions, printers, cell phones, and other electronic devices are replaced by a new generation of technology. Electronics contain lead, cadmium, and other toxins, that should not be disposed in landfill. In 2010, 162 tons of electronic waste shipped out of our district. This is a 100 ton increase over the 2009 tonnages. Each county collects E-waste and the District coordinates shipping to Unicor in Texarkana, Texas. Transportation costs for District e-waste is reimbursed through ADEQ grant funding. In 2010, the District received $10,738 to cover the transportation costs. Household Hazardous Waste includes paint, insecticides, cleaning chemicals, and a variety of other chemicals used around the house. Four counties participate in collecting household hazardous waste. Please reference your county tab to see what services and items your center receives. In 2009 and 2010, a total of 100 tons of Household Hazardous Waste was collected. In 2010 over 213,000 tires were collected through the District’s Waste Tire program. Tires collected through this program are repurposed by Champlin Tire Recycling of Concordia, Kansas, into benches, picnic tables and mulch. All tires are accepted, but fees may apply to the disposal of specialty tires. To learn where you can dispose of unwanted tires in your community, see your county’s link to the left. The District coordinates with local law enforcement to investigate, prosecute and conduct cleanup activities for illegal dumping in the six-county area. To report illegal dumping, contact our Executive Director at 870-688-3889. In 2010, 13 illegal dump sites were investigated, including a successful cleanup operation in 2010 held in Newton County (.pdf).